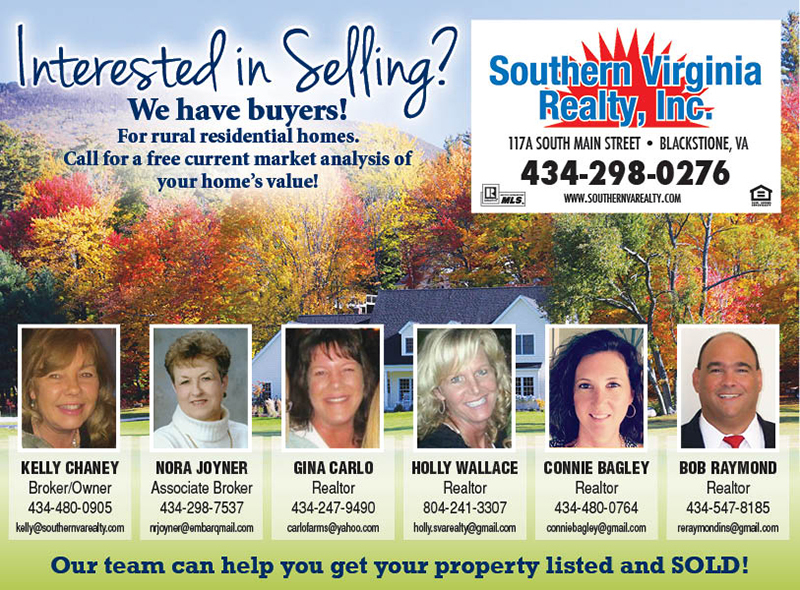 Homes and land for sale in Southern Virginia. Whether you are looking to buy or sell a house, town house, condo, land, farm, or commercial property in or around Lunenburg, Nottoway, Charlotte, Brunswick, Dinwiddie, Mecklenburg and Prince Edward counties, including the towns of Kenbridge, Victoria, Blackstone, Keysville, Farmville, Alberta, Lawrenceville, Crewe and South Hill, or the surrounding areas then you have come to the right website. Here you will find a wide array of information about local real estate for sale. By working with a local Realtor you have the advantage of being able to access all local listings available through the Multiple Listing Service, MLS. Using a Realtor also gives you the comfort of knowing that you are working with the most qualified professional who is dedicated to you as the buyer or seller and will always be looking out for your best interests and striving to make the process of buying or selling real estate as comfortable and pleasant as possible. Also, we can show or sell any property listed in the Commonwealth of Virginia regardless of location or listing firm. We also specialize in property management from one property to multiple properties.